I wolud like to know whether I have unread messages at Google Wave or not, like Google Notifier for Mac for GMail and Google Calendar. I could find Google Wave Add-on for Firefox at That Smith. So I implemented one as referencing the add-on. Thank you Chad at That Smith. 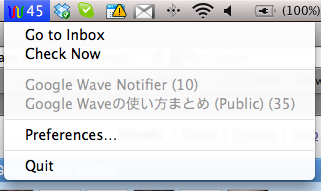 You can download it form Downloads for hiroshi's Unofficial-Google-Wave-Notifier - GitHub. Before download it, be sure that is makes NO WARRANTY. It looks great, but I can't get it to work. I'm getting "SecKeychainFindGenericPassword: failed. (OSStatus: -25300)" and "SecKeychainAddGenericPassword: failed. (OSStatus: -61)" errors in the log. Do you have any idea what might be wrong? * Leopard or Snow Leopard? * if Leopard intel mac or power mac|book? * Downloaded binary release or built yourself? Please answer those above as a comment of the issue at the url I mentioned. the zip version seems a bit messed up, it tries to open de text documents in terminal, the tar version has the right extensions. I am just looking for a howto to install the whole thing, there is no .app or install file? There are two categories for download files on github. The lower part of them are source archives (tgz | zip) at tags. You should download the latest binary zipped package form top of the link on the downloads page. The direct link to the latest one is here. I hope you get a clue. One question - could you add a way to get it to open the Inbox in a browser other than the 'default' browser? Perhaps an additional setting? Or, is there something in the app contents I could edit to have it use a different browser? Currently there is no such setting ui nor file at all. However, it's nice to have such a preference setting. I added this to TODO list. Looks great! Nice work Hiroshi. It could be difficult to done without referencing your Firefox Add-on. By the way, I'd like to change auth system from ClientLogin to OAuth. Do you have any idea? I've forked the source code to create a Waveboard client friendly version (checkout out http://www.getwaveboard.com/ if you haven't). Clicking "Go to inbox" fires up Waveboard if it's not loaded (takes you inbox). Clicking a wave from the notifier while waveboard is loaded will load up the wave in waveboard. This should probably be configurable. But does the job for now. Any chance you can make it able to use a Growl notification? There is a issue for this and now under development. I had it installed in a ~/apps folder. Moving it to /Applications and it worked like a charm. I tried it today and so far it works fine for me. I'm using MacOS 10.5.8. Thank you for writing this notification tool! I was looking for something like this. Thanks for google wave noti. MAC..
blog.yakitara.com is resolved by the grace of FreeDNS.